2018 will be a critical election year to determine control of Congress. More than two dozen seats in the House of Representatives are currently deemed “toss-ups,” where both political parties have similar chances of winning. Dozens of other races are also extremely competitive, including many races where Asian American and Pacific Islander (AAPI) candidates are running this year. These competitive races include Texas’s 23rd Congressional District, currently represented by Rep. Will Hurd, who is challenged by Democratic opponent Gina Ortiz Jones, who is Filipina. Another is California’s 39th Congressional District, where longtime Rep. Ed Royce is retiring—and AAPI candidates including Young Kim (R) and Mai Khanh Tran (D) are running in a crowded field to replace him. Many of the AAPIs running for Congress this year are first-time congressional candidates, including Jones and Tran. Thirteen candidates are incumbents, including the current Members of the Congressional Asian Pacific American Caucus (CAPAC). Of these current AAPI Members of Congress, Senators Tammy Duckworth and Kamala Harris—elected to their terms in 2016—are not up for re-election, while Rep. Colleen Hanabusa is not running for re-election to her House seat, opting instead to run for Governor of Hawaii. In the table below, we have organized every AAPI congressional candidate running this year, including candidates who have already lost their primaries or have withdrawn from consideration since they’ve launched their campaigns. It includes both Senate and House candidates, as well as their Federal Election Commission (FEC) filings on funds raised to date. In this list, we have only included candidates that have at least registered with the FEC with statements of organization, regardless of the total amount of their campaign contributions. Note: District with a value of “0” indicates a Senate race. D = Democrat, R = Republican, L = Libertarian, and I= Independent. Of these candidates, 68 have raised more than $10,000, while 53 of them have raised funds greater than $100,000. About a fifth (18) of these candidates have raised more than $1 million, a group largely composed of incumbent candidates or candidates in competitive races. 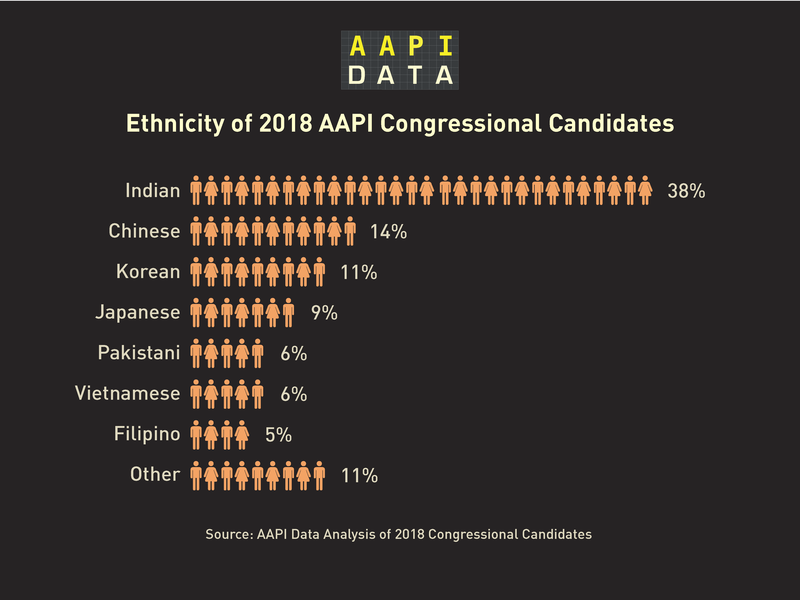 More than 45% of the AAPI candidates running for Congress this year are South Asian, with more Indian American candidates (38%) than any other AAPI subgroup. Chinese Americans and Korean Americans also make up a significant number of candidates this cycle, where nearly 14% of AAPI congressional candidates are Chinese American, and more than 11% are Korean American. 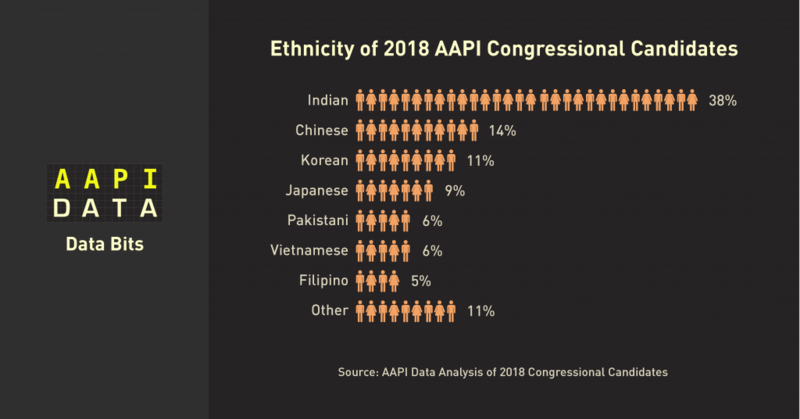 There are disproportionately more Indian Americans running for Congress compared to their share of the AAPI population—38% of the AAPI candidates are Indian American, while Indians are 17% of the AAPI population. 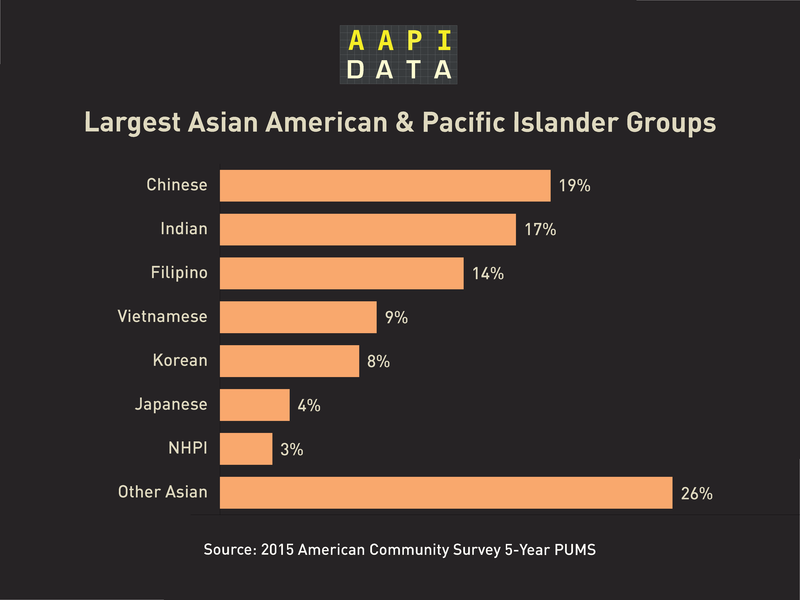 Korean Americans and Japanese Americans are also slightly over-represented in the candidate pool, while there is a smaller share of Chinese Americans and Filipino Americans running for Congress compared to their share of the broader AAPI population. The significant numbers of Indian Americans running this year could be attributed to organizations like the Indian American Impact Fund, which recruits and supports Indian Americans running for office. At the same time, there are several other AAPI organizations with similar missions for other groups, including PIVOT (The Progressive Vietnamese Organization), and organizations that support all AAPI candidates, such as ASPIRE PAC. The high number of South Asians running may also be attributable to the record number of Indian Americans who won election to Congress in 2016. Nearly a quarter of all AAPI congressional candidates (20 individuals) are running in California, more than any other state. California is followed by Hawaii with 8 candidates (~10% of total), and Texas with 7 (~9%). Many of these candidates still face upcoming primaries—such as in California and New Jersey on June 5th or in New York and Colorado on June 26th—that will again change the landscape on which congressional hopefuls will ultimately land on the November ballot. However, it is clear that AAPIs are poised to not only have a substantial impact on the outcome of the elections this fall, but AAPI congressional candidates will play a critical role in these elections. Information on candidates based on an analysis of Ballotpedia data. Data on campaign finances are from ProPublica’s FEC Itemizer.